WHITEHORSE - Huxley Briggs was just tall enough to see over the store counter, but that didn't throw the five-year-old off his pitch to sell his Yukon-wood building blocks. When the young entrepreneur approached Betty Burns at her Yukon toy store he asked to speak to the owner about buying his homemade blocks. "I took one look at him and my heart melted. I actually teared up," Burns said of the day the boy walked into Angellina's Toy and Children's Boutique. "He said he is five years old and makes the blocks all by himself ... and he had an idea he could sell them." The rectangles and wedges came nicely packaged in plastic with a label in his own printing that read "Huxley's Block Company." Burns, who's also a Grade 1 teacher, began negotiating on a price. "He said 'five dollars' and I didn't say anything and I looked over at his mom ... She nodded and said 'yes.'" Burns thought Huxley might have been under-valuing the product and she offered to buy 10 sets — as many as he could manage to make — for $10 each. The sets sold out in one day and Burns now has a waiting list. The business-boy spirit didn't surprise Huxley's mother, Amoree Briggs, who said she and her husband often talk with their son about saving money and investments. She said Huxley got the idea from looking over some scrap wood in her husband's shop. The boy also knew that his two-year-old brother really liked to play with the blocks. Bernard Briggs and his son then spent a couple of hours working on the idea together. Many of the blocks were made by Huxley himself using power tools, which his mom admitted was "a little bit nerve-racking at first." "My husband, he was that way when he grew up. His dad showed him early how to use tools. He really explains safety precaution." 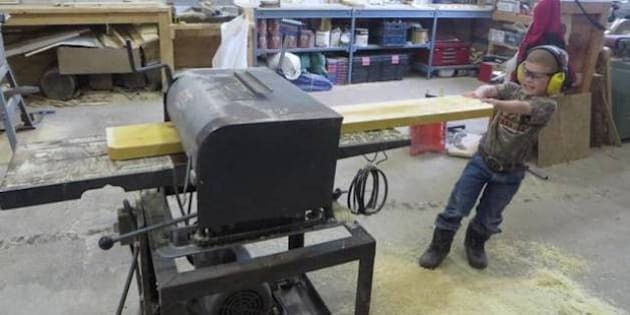 He doesn't cut the small blocks with a saw, she said, but uses a belt sander and a wheel sander and helps his dad with the planer. And, with the heavy demand, Huxley has had to call in some extra help, Mom said. "He's negotiating with his grandfather to come out and help him with the next set of blocks. He's agreed to take him out for ice cream and a movie if he comes and helps," she said with a chuckle. Huxley, who is kindergarten age and has been home schooled, has purchased himself a toy, bought his sister some knitting supplies and put some cash into an investment account with the block proceeds. Burns is selling the blocks for $20 each and is donating the profit to Big Brothers and Big Sisters of Yukon, the family's charity of choice.